The following is the current editorial in the Newsletter issued monthly by ATAC [Action for Tasmanian Autistic Children]. ATAC was established to provide free advocacy for all those who have difficulty with government and other bureaucratic bodies when they want to gain services for members of their families who are on the spectrum. Another key function of ATAC is to fight for the recognition of Autism as a brain disorder based in neurological science rather than a psychiatric condition, and to lobby for evidence-based programmes to assist autistic people to reach their full potential. One of our major activities is the publication of a monthly newsletter in which we feature issues important to our autistic community, and provide links to the most recent research. The Centres for Disease Control in the US (CDC) have just released the results of a survey which shows that 1 in 7 American children have a mental, behavioural or developmental disorder. As these figures were collected 2011-2012 it is probable the numbers have already increased. Just a few months ago the CDC reported an autism rate among children of six years of age of 1 in 48. For the last 20 years autism rates have been growing at 20% per annum, that is doubling every 5 years. When we turn to Australia, it is the growth in the brain disorder section of disability that has created the present crisis in disability care. Firstly, it destroyed the individual State services that were set up to care for the disabled in the community. Dissatisfaction with State services became so great that responsibility was transferred to charities. As it became clear that the charity sector could no longer cope, responsibility is now being moved to a National Disability Scheme (NDIS). There are already clear signs that the numbers of people with autism in Australia are already too great for the NDIS to be able to function in the way it was intended. At no stage did any State or Federal Minister institute an enquiry into WHY these previous schemes had failed. This process illustrates the lack of policy making skills on all sides of politics, and for this reason it was just assumed that throwing money at a deeply flawed system would fix the problems that resulted in failure! The Productivity Commission Enquiry into the feasibility of establishing the NDIS was limited to whether the Commonwealth had enough revenue to pay for a national scheme. Another five years have passed since the Productivity Commission handed down its report, and autism numbers in this period have doubled. The result is that even before we see the full roll out of NDIS, the same problems beset it as those that caused the failure of the previous Disability Schemes. We can expect a similar situation to develop for the funding proposals for disability education under the Gonsky reforms. The assumption here is that all that is needed is greater funding for the present (failing) practice, namely the provision both of untrained teacher’s aides, and teachers who have no specific training in how to draw up effective programmes for children with autism. The truth is that many of our schools are dangerous for our autistic children. Two thirds of children with autism have language delays, some don’t speak at all. When a teacher speaks at a normal rate, these children will not understand what they are being taught. Many have sensory problems and the noise of a normal classroom and playground will be agony for them. These children often react by attempting to flee the situation, or by becoming violent in order to escape from the environment they are forced into. In addition, they suffer from bullying by other children and in some cases, from teachers themselves. These are the reasons many parents opt for either distance education or home education for their child. Nine years later in Australia the NDIS publishes on its website that it will provide generic early intervention services. These services have been selected on the basis that they work for neuro-typical children BUT THERE IS NO EVIDENCE THAT THEY WORK FOR CHILDREN WITH GENETIC CONDITIONS SUCH AS AUTISM. What is even more disturbing NDIS embraces the discredited ideas of Kanner, and implicitly blames mothers for their children’s autism. THE IDEAS THAT THE NDIS ADOPTS ON AUTISM ARE ONLY 70 YEARS OUT OF DATE!!! The Human Genome Project began in 1990 and concluded in April 2003. It provided researchers with powerful tools to understand the genetic factors in human disease, and thus paved the way for new strategies in the diagnosis, treatment and prevention of brain disorders. Today, 13 years after the completion of the HGP, vast strides have been made in our understanding of brain disorders and of their treatment. All this new knowledge has passed Australia by. This is particularly true where autism is concerned. Right from the beginning of the HGP, the US clearly stated its objective of bringing brain disorders under a medical model. In other words, they intend to find the causes of brain disorders, and to diagnose and treat them in the same manner as they do every other disease of the body’s organs. They have since been joined n this endeavour by the EU, Japan and various other nations. There have been vast advances in our knowledge of brain disorders since the HGP. The cost of a genome wide scan (GWS) is now less than $1000. New tools have been invented that make it easier for scientists to explore the make up of the human genome. These now include the CRISPR CAS9 genome editing tool. In another major advance, brain spheroids are now able to be built from stem cells. Scientists can, therefore, study sections of the brain and to test proposed treatments for them using these spheroids. We also now have the Oxford Nano Pores genome scanning device. This device offers the promise that every doctor’s surgery can take a genome wide scan with a hand held device linked to a computer for less than a hundred dollars. As researchers gained greater knowledge of the genetic basis of brain disorders, it was seen that their findings contradicted the diagnostic criteria of the DSM. This resulted in the research industry abandoning the DSM as a diagnostic tool. In its place a new diagnostic system based on the genetic causes of brain disorders is being constructed. The new RDoC system is not yet complete, but there is a $94 million programme run by the Simons Foundation which is identifying autism genes. The database constructed from the research funded by this programme is available free of charge to other researchers, who are in turn asked to notify any confirmed genes from their own research so these can be added to the same database. The Simons Foundation programme is designed to eventually identify all the different types of autism, and to work towards finding cures for the various subtypes they identify. At present, there are 6 types of severe autism that have been identified and trials are now commencing to validate their treatment. HOW CAN WE NOW MAKE THE NDIS A RELEVANT AND EFFECTIVE BODY FOR THE DISABLED? The first thing that has to happen is those with physical disabilities must have an effective system in which adequate finance is provided to meet their needs. This must be a separate body from the one responsible for people with brain disorders so its funding has to be kept separate. The needs of these two groups are entirely different, and therefore must be based on different models, The increases of funding demanded by the continual increases in the numbers of disabled people who have brain disorders, particularly the increase of those with autism, cannot be allowed to create shortages of funding for those with physical disabilities. So, what then needs to be done for those who have brain disorders? I propose that a separate body should be established, namely a National Brain Disorders Insurance Scheme. (NBDIS) Its role would be to oversee the integration of diagnosis and treatment of brain disorders into the general medical and hospital services. This would occur alongside the discovery through research of the various genetic causes of the different types of brain disorders. For the purposes of this article, I will focus on the areas of autism and intellectual disability. These are the two largest disability groups, comprising over 60% of total disability and approximately 70% of disability caused by brain disorders. The two are closely related, with 60% of those who are autistic also suffering from intellectual disability. While other brain disorders tend to appear at a later stage in life, these two disorders are present at birth. It is quite clear that unless we can solve their problems, we will be unable to afford proper services for all the disabled. The sheer numbers of those with autism and intellectual disability will eat up the funding that is available, and those with other disabilities will suffer. There is a controversy at the moment centred around the type of early intervention services to be provided by the NDIS. As stated earlier in this article, NDIS is proposing to finance only generic services that are used for neuro-typical children who need discipline. Autistic behaviours are caused by genetic problems, not by misbehaviour. The programmes listed by NDIS do not address the genetic causes of the behaviour of those with autism and intellectual disability, and there is NO EVIDENCE that they will in fact work with behaviours stemming from genetic problems. Indeed they may have absolutely no effect on the behaviours of autistic children and well may do significant damage to the child-parent relationship. On the other side of the debate, we have autism advocates and service providers who argue that the NDIS has rejected as unacceptable the only behavioural intervention programmes which are evidence based and proven effective for autistic children, namely ABA programmes. These programmes can require up to 40 hours a week therapy to be implemented effectively. Is there anything in the most recent research that can establish who is right in this controversy? The answer is yes! Scientists have known that microglia in the brain have been the garbage sweepers of the brain. For example, if their is an injury to the brain, it is the microglia which collect and dispose of the pieces which have been damaged. Recently however, scientists have discovered a second function of the microglia. The brain of a newly born baby comprises billions of neurons that connect via an unimaginable number of junctions or synapses. What has been now established is that microglia snip away synapses that are not required. We now know that sensory input triggers this process. As the newborn explores its world, cellular mechanisms respond, snipping away the connections which are not being used and strengthening those that are. If the autistic child is a hand-flapper, for example, its brain will strengthen the pathways which will support hand-flapping. If the child does not look at its mothers eyes, other pathways will be strengthen and eye-contact will be significantly weakened. It is in this manner that an autistic brain is built. It stands to reason, that the longer this process goes on, the more intense and longer-term the intervention needed to reverse its outcomes will need to be. IT IS IMPERATIVE that intervention is commenced as soon as possible. Here there is a problem. The earliest a child can be diagnosed with autism using the DSM criteria is 3 years of age. At the same time, the new RDoC system is not yet available. My proposal overcomes this problem. If we use the diagnosis of developmental delay, we will place children with autism as well as children with intellectual disability into early intervention in the first year of life. In Australia we have a system of Child Health Nurses who are experts on child development, and can tell when a child is not meeting normal childhood development milestones. All that is missing is the knowledge of the techniques needed. These can then be taught to parents so that they can deliver early intervention to the child. At that age, all that is needed is 1 hour a day of therapy. In other words, this small group of Child Health Nurses be trained in the appropriate techniques so that firstly parents can be taught the necessary intervention techniques and secondly that follow-up visits can occur where necessary. The earlier we start intervention, the better the result, and at a minimal cost. The progress of each child will need to be reviewed at 3 years of age. It is at this point that a more intensive intervention will be needed if the child is still not progressing, and any co-morbidities contributing to the problem will also need treatment. Genome-wide scans for these children should be now conducted in order to identify the exact genetic problems that underlie the child’s specific form of autism. Individual programmes will then be able to address the specific needs of each child. All these procedures should be conducted in hospital day clinics. Staffing of these clinics should include all the necessary specialists such as speech pathologists, physiotherapists and qualified behavioural analysts. Epilepsy is the most frequent cause of early death for children with autism. It is therefore essential that these children have access to experts in this area, and this also can be conducted through these day clinics. The protocols of the International League Against Epilepsy need to be adopted as part of this procedure. Children who do not meet these criteria should remain in the clinic until they do. We should adopt the US system whereby children with disabilities can remain at school past the normal leaving age, even into their mid-twenties, providing they are still progressing. Doing this will open up tertiary education to many children who under the present system are denied that opportunity. To ensure that people with Brain Disorders are able to receive the treatment they require, we need to be able to train sufficient levels of professional staff. In New Zealand for example, there are two universities who offer courses allowing students to qualify as Board Certified Behavioural Analysts (BCBAs). Australia has no university offering these qualifications, nor are there any courses offering qualifications to become BCBA assistants. These are essential elements for any plan for successful autism therapy. To help with programmes for children with autism in our schools, other states need to follow the example of the Tasmanian government, which is introducing the US based Internet programme, Rethink (Autism). It has the capacity to draw up individual evidence based programmes and to train teachers and aides to implement them. WHAT DOES THE FUTURE HOLD FOR BRAIN DISORDERS? With the advent of gene editing tools such as CRISPR CAS9 it is becoming clear gene editing techniques will play a significant role in curing many brain disorders. This has begun already, with the curing of a rare fatal blood disorder in England and and more recently with the news that scientists have been able to cure HIV Aids by using gene-editing techniques. While these methods are still in their infancy, it is now clear that they will play a major role in the near future. Recent research has given an insight into the reasons for older fathers having a 37% higher rate of autistic offspring than the general community. At one time this was thought to be caused by environmental factors as neither parent carries the responsible genetic mutation. What recent research has shown is that the male sperm does carry the mutation, and it is now thought that the male sperm deteriorates with age. If the male sperm is tested prior to conception, then gene editing could eliminate that extra 37%. As the genetic causes of the various types of autism continue to be identified through research, and cures are found for them, we can revisit group homes, and using genome scans we can change the futures of those who need to live within these facilities. Many may well be able to function as fully independent and productive members of our community. The proposals I make are in line with the move to bring brain disorders into the medical model. They transfer the treatment of those with Intellectual disability and those with autism into the national health scheme where they belong. They are also flexible enough to be reviewed and amended as new research further enlightens the causes of brain disorders. By splitting the NDIS, we guarantee that those with physical disabilities do not suffer because of the growth of brain disorders. The NDIS in its present form can only repeat the failures of the past. Any proposal that just allows autism to keep growing while ignoring the recent and dramatic scientific advances in this area will very quickly become economically unviable. By accepting change to reflect our new growing knowledge of brain disorders, we can reduce the economic burden of autism and improve the lives of many families. WHAT ARE THE HIDDEN COSTS OF ‘MORE OF THE SAME’ TO OUR AUTISTIC COMMUNITY? A report in Spectrum News released on March 14 2016 highlights a disturbing statistic. People with autism die on average 16 years earlier than those without the condition. 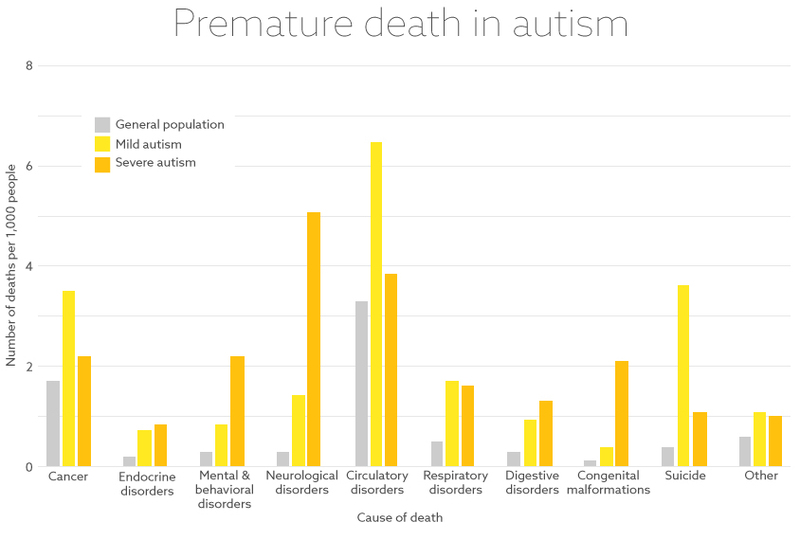 For virtually all causes of deaths studied, death rates are higher in people with autism than for people in the general population. - See chart at the end of this article. Epilepsy is the most common cause of death for those with severe autism. FOR THOSE WITH MILDER FORMS OF AUTISM SUICIDE IS THE MOST COMMON CAUSE OF DEATH.